I clearly remember when I first caught sight of a pocket projector – it certainly bowled me over with the possibilities, but after getting one, I rarely used it. Come to think of it, it has seen action just a handful of times, so much so that I can even count it on a single hand. I suppose it does not cater to my needs, but enough market research and case studies must have been done in order for pico projectors to be approved and manufactured. 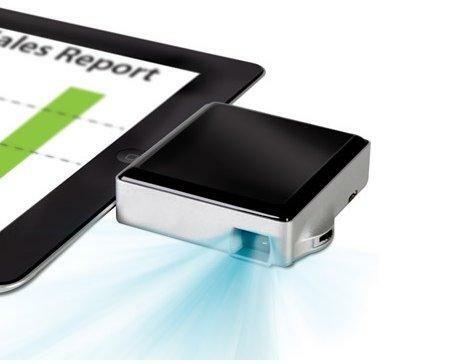 Those who tend to make business presentations on the go might find this $249.95 iPad Pocket Projector a boon, especially when you need to throw that money making pitch among a group of potential investors, instead of meeting them one by one. The iPad Pocket Projector says it all, where it can hook up directly to an iPad for it to instantly display enlarged views of photos, movies, and presentations. It will arrive in a physical form factor that is smaller than a smartphone, tipping the scales at under 5 ounces, where it will plug into your iPad’s 30-pin charging port, making your iPad look like some sort of Borg entity. In a nutshell, you can transform a small room into a mini movie theater of sorts sans complicated setup or cables. The iPad Pocket Projector will come with a 35-lumen LED that delivers 6″ to 60″ diagonal images from 8″ to 78″ away with a 4:3 aspect ratio. Unfortunately, the projector’s resolution maxes out at 640 x 480 pixels, but thankfully there is a manual focus wheel that helps you fine-tune image clarity, alongside controls for the audio level. The LED itself has been rated for 20,000 hours, and it will play nice with all iPads, the iPhone 4S, 4, 3GS, and third and fourth generation iPod touch.